Posted on January 3, 2012 by admin in MessageNet Connections. A PC Alert is a small computer program that can be downloaded from the MessageNet website. It’s meant only for receiving messages and it’s how messages are sent directly to computer screens. 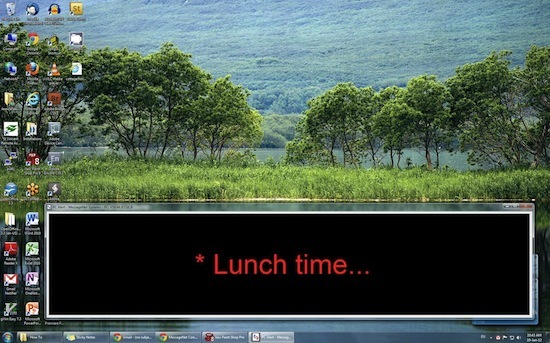 Unlike an e-mail, which might go unread or unnoticed for a while, a PC Alert message pops up on the computer screen in front of everything else, big and bright, so it’s instantly noticeable. It can be minimized, but not closed, until the message expires. PC Alerts are best used for mass communications. Every person with a PC Alert can receive the exact same message at the exact same time in an instantly noticeable format. PC Alerts can be downloaded on each computer directly from the MessageNet website. They can be downloaded to either a PC or a Mac and are easy to download on either operating system. They’re one of the easiest ways to contact lots of people at the same time, for any reason. 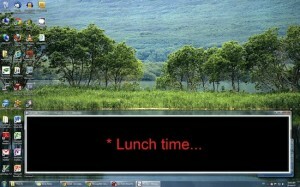 MessageNet systems uses PC Alert to let everyone know when it’s lunch time. PC Alert can be used to send a private message from one person to another or to give mass notifications. They can be used for emergency alerts and have been used successfully in deaf schools, where traditional forms of emergency notifications aren’t practical.